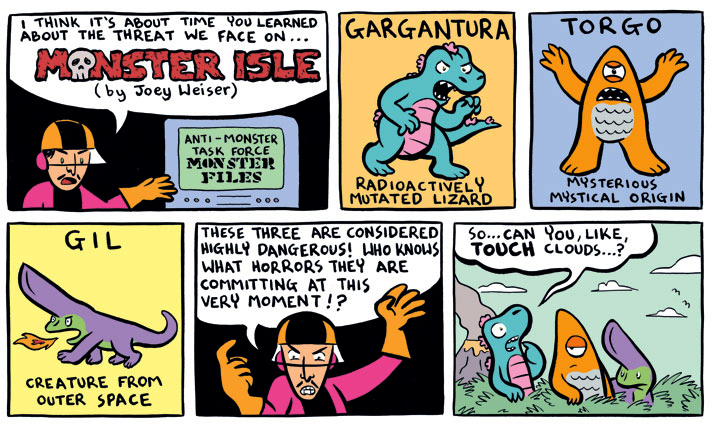 Monster Isle » Archive » Welcome to Monster Isle! Welcome to Monster Isle! This is a new weekly webcomic by yours truly featuring the monstrous Gargantura (or “Gary” to his friends), Torgo, and Gil and their day-to-day life on the tropical island they inhabit. A black & white version of Monster Isle originally appears in the weekly Athens, Georgia publication Jake. A week later, each strip will appear online and in full, glorious color. So, bookmark the site or subscribe to the RSS Feed so that you won’t miss these guys every week! WOO! this is gonna be good. Yes! I love the “Manos” reference… and the Guiron reference… this should be fertile territory for you, Mr. Weiser. The Guiron ref is intentional, the Torgo one was not! Oh, the subconscious mind…. haha! Really great work Joey! Fantastic stuff my friend! Awesomeness is coming to the internet!I bet monster isle with be awesome,concentrating comic art skill,creativity and humour into this few panels is great!Keep up the good work ! Sweet! I’m excited to see what kind of tomfoolery you make around here. Fun concept! KAIJU! Fantastic! The art and color palette is great. And I am really enjoying that dude’s strange hazmat suit. Nice man! The site looks great! Thanks so much everybody! Hope you keep enjoying the strip week to week. And big thanks to Brett for helping me get to know WordPress! this is great. I’ll be back. Looks great! Very neat concept for a webcomic.